The Erebus Academy has expanded into karting in a tie-up with 18-time Australian champion Dave Sera. 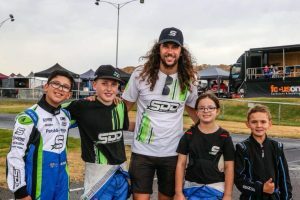 Erebus Motorsport’s new relationship with Sera Driver Development (SDD) will see Sera nurturing cadet and junior karters with a view to seeing them eventually progress to Supercars. “Our aim is to provide a pathway from go karts through to Supercars and by aligning with Dave and his team, we are able to connect a few more of the dots,” said Erebus CEO Barry Ryan. “Not only are we able to nurture young drivers but more importantly, pass on our knowledge and expertise to karters, families and their support groups of what to target and expect beyond karting. SDD currently fields several young drivers in the SP Tools Australian Kart Championship and Sera is pleased to link with Erebus. “It’s a privilege and a great honour for my SDD team to be aligned with a highly successful Supercars team,” said Sera. The announcement comes after Erebus formalised its ties with Image Racing, which competes in the Dunlop Super2 Series in with ex-Erebus Commodores and also the Kumho Tyre Super3 Series, this year. Current Erebus Virgin Australia Supercars Championship driver Anton De Pasquale will be involved in the karting program. “I did some training with Dave when I started karting and since then we have kept in touch; more recently teaming up for the endurance race at Todd Road,” said De Pasquale.